The U.S. government receives largely positive reviews for how it treats its own people. 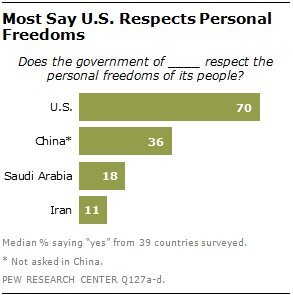 When respondents are asked whether the U.S., China, Saudi Arabia and Iran respect the personal freedoms of their people, the U.S. government achieves the highest ratings, with a median of 70% across the countries surveyed saying the American government respects the freedoms of its people. The governments of China (36%), Saudi Arabia (18%) and Iran (11%) do not fare as well. Pluralities to majorities in 37 of the 39 nations surveyed say the U.S. government respects the personal freedoms of its people.2 This includes large majorities across Europe, Africa and much of Latin America and the Asia/Pacific region. The highest ratings for the U.S. on this question come from the Philippines (91%) and South Korea (90%). And at least eight-in-ten hold this view in Lebanon (87%), Japan (85%), Israel (83%), Italy (82%), Germany (81%) and France (80%). In many countries, there has been significant improvement on evaluations of the U.S. since a spring 2008 Pew Research poll taken during the final months of the George W. Bush administration. The biggest change is in Lebanon, where those saying the U.S. respects its people’s rights has jumped 32 percentage points since 2008, with double-digit increases among all three of Lebanon’s main religious groups (Christians, Sunnis and Shia). There have also been double-digit gains in Spain (+20), Argentina (+16), France (+15), Germany (+11) and Indonesia (+11). Additional gains were seen in Pakistan (+9), Australia (+7), Britain (+6) and South Africa (+6). Even in many nations where overall ratings for the U.S. are low, the American government receives high marks for respecting individual liberties. For example, even though only 11% of Pakistanis have a favorable opinion of the U.S., 54% say the U.S. government respects the personal freedoms of its people. Only in Jordan (49%), Turkey (48%), China (48%) and Egypt (45%) do less than half say the U.S. respects these rights. Interestingly, the American people themselves are more critical of their own government’s record on individual freedoms. Only about seven-in-ten Americans (69%) say the U.S. government respects its own people’s rights, with a significant minority (28%) saying the government does not respect these freedoms. Additionally, the only country where evaluations of the U.S. government have declined is America itself (-6). Compared with the U.S., the government of China receives much lower ratings for how it treats its citizens. Across the nations polled, a median of 36% say the Chinese government respects the personal freedoms of its people. Majorities or pluralities hold this view in only 13 countries. Throughout North America and the European Union, large majorities, including more than eight-in-ten in Germany (87%), France (86%), Spain (84%) and Italy (82%), believe individual freedoms are not respected in China. However, in Russia, a 47% plurality says China’s government respects the rights of its people. Views are more mixed in the Middle East, with more than half in Lebanon (68%), the Palestinian territories (58%) and Tunisia (53%) saying China respects personal freedoms, but less than half saying this in Jordan, Egypt, Israel and Turkey. In Asia, clear majorities in the predominantly Muslim countries of Pakistan (65%), Indonesia (60%) and Malaysia (57%) think China respects the rights of its people. In the Philippines, views are divided, with 51% saying China respects its people’s freedoms and 44% saying it does not. Large majorities in Japan (88%), Australia (74%) and South Korea (68%) have a dim view of China’s record on this issue. Evaluations are more mixed in Latin America, with many people not offering an opinion. Ratings for the Chinese government are highest in Venezuela (52%) and lowest in Argentina (26%) and Chile (25%). Assessments are generally positive in Africa, with about six-in-ten Nigerians (63%) and Senegalese (59%) approving of China’s treatment of its own people. Since 2008, positive evaluations have become more common in a few countries, notably Lebanon (+20 percentage points), as well as Russia (+8), France (+7), South Africa (+7) and Poland (+7). Evaluations of the Saudi Arabian government’s record on personal freedoms are low. In only seven countries do a plurality or majority say the Saudi government respects the personal freedoms of its people, with an overall median of just 18% saying this across the countries surveyed. Opinions of the Saudi regime’s treatment of its own people are especially low in North America and the EU. Negative evaluations are also common in Latin America and Israel. Of the predominantly Muslim nations surveyed, clear majorities in Pakistan (65%), Senegal (63%), Jordan (60%), Egypt (59%) and Nigeria (55%) say the Saudi government values human rights. Views are less positive in Malaysia (46%), with many not offering an opinion. However, in Lebanon, Turkey, the Palestinian territories and Tunisia, assessments of the Saudi government are decidedly negative, with half or more saying the government does not value the rights of its people. Views of the Saudi government’s commitment to citizens’ rights are mostly unchanged among the countries surveyed in 2008 and 2013, but positive evaluations have plummeted in Lebanon (-41 percentage points), with Lebanese Shia views of predominantly Sunni Saudi Arabia dropping 78 percentage points. Positive assessments of the Saudi regime have also fallen by double digits in Germany (-11). Majorities in most countries surveyed say the government of Iran does not respect the personal freedoms of its people, with a median of only 11% saying Iran respects its people’s freedoms. Criticism of Tehran’s rights record is most pronounced in the EU and North America, where at least three-quarters of those surveyed say Iran does not respect the basic freedoms of its citizens. In the Middle East, most are skeptical of Iran’s rights record, with roughly nine-in-ten Israelis (91%) saying Tehran does not respect the rights of citizens, and at least six-in-ten agreeing in Turkey (68%), Egypt (66%) and Jordan (61%). About six-in-ten Lebanese (61%) also say Iran does not respect personal freedoms, but there is a religious divide. Around three-quarters of Lebanese Sunnis (76%) and Christians (72%) say the Iranian regime does not respect individual rights, but 73% of Lebanese Shia say that the Iranian government does protect the basic rights of its predominantly Shia people. In Latin America, half or more in all seven countries surveyed agree that the Iranian government does not protect the rights of Iranians. Views are more mixed in Africa. On balance, most of the publics surveyed tend to believe the Iranian government does not respect personal freedoms, however many do not offer an evaluation. Assessments of Iran’s rights record vary in Asia, with majorities in Australia (81%), South Korea (75%), Japan (69%) and the Philippines (59%) saying Iran does not respect its people’s rights. Opinion is more mixed in China, as well as the predominantly Muslim nations of Indonesia and Malaysia. Pakistan is the one country surveyed where a majority (57%) says that Tehran does respect the rights of its citizens. For more on Iran’s personal freedoms record and overall image see Global Views of Iran Overwhelmingly Negative, released on June 11, 2013.